I always wondered what patronage of my poetry or art might look like. Who would be willing to help fund my work? What would that funding entail? Would it stifle me or free me to create? Well, now I know. For my birthday, The Father gave me a set of Dr. Ph. Martin’s Bombay India Ink colors, a set of Dr. Ph. 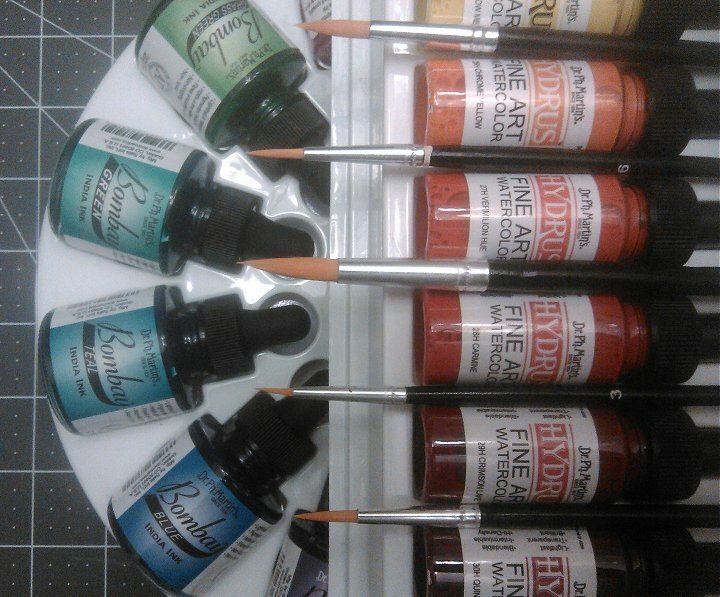 Martin’s Hydrus Fine Art Watercolor Ink colors, and a set of watercolor brushes as gifts. I was slowly building a palette of inks (exclusively Dr. Ph. Martin’s, by the way), bottle by bottle, as I sold various pieces of work. Each new bottle allowed me a bit more freedom to experiment and try to find my “voice.” With the addition of twelve additional colors of watercolor and twelve additional colors of India ink, as well as many brushes of various sizes, it could play with colors and imagine new Inktopodes. Perhaps it wasn’t patronage in the traditional sense, but for me it had the same effect. Who would be willing to help fund my work? In this case, obviously, my father. As someone who has discovered and kindled his own artistic impulses over the past two decades (primarily in woodworking), he has become one of the strongest champions of my work (in whatever form, poetry or painting/drawing). What would that funding entail? It entailed providing me supplies that I may have eventually ended up gathering myself, but at a much accelerated pace that I couldn’t imagine on my own. It entailed providing me with supplies that I didn’t ask for, but for which I am exceptionally grateful and that were exactly what I needed. Would it stifle me or free me to create? Considering these came as gifts, without conditions, these inks and brushes have definitely freed me to play a bit looser than I would have otherwise. I welcome the opportunity to experiment and the liberty to better attempt to have what I imagine take on material form. In summary, this “patronage” was rather welcomed. It allows me to work faster and freer. For these inks and brushes, as well as for the support of The Father, I am extremely grateful.